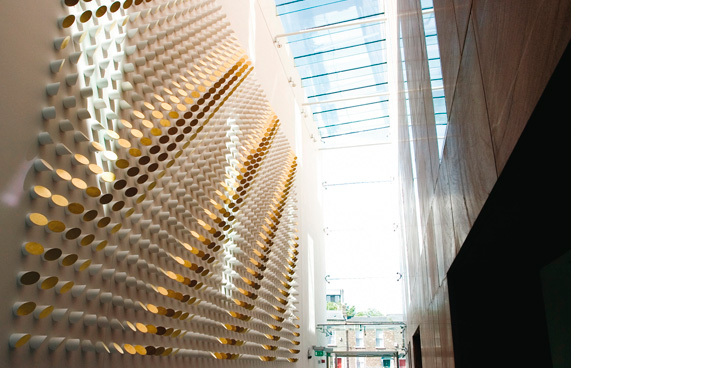 One Grand Parade in Dublin was designed by OMS Architects and completed in 2009 for private clients. Part of the concept for the building envisaged a three-storey atrium, which acts as a buffer between an adjacent Georgian terrace and the new main office space. This atrium was conceived as a narrow canyon-like space with a frameless glass roof and front façade with one side a sheer blank rendered wall. The main office building faces on to the atrium and forms a second wall of stone punctured with openings of reception area and windows to the offices. The materials used in this space are minimal and include glass, stone and plaster. The architect and owner of the Building considered that this entrance, although powerful in its impact due to its volume and configuration, required an extra element to signal its presence as an entrance and to attract the passer-by. Sandra Nowlan, Project Architect asked the artist Peter Monaghan to meet with her and John Smyth of OMS Architects, to discuss the potential for a commissioned piece. The meeting resulted in the collaborative journey of Twelve Tones, the final commissioned piece that has involved the explorative expertise of architects, artists, Gormley Fine Art Gallery and various artisans. Twelve Tones measures 10 meters in length and 5.2 meters in height. It includes 1323 wooden dowels cut at an angle to reveal an elliptical surface, gold leafed and arranged in a pattern, to reflect the light and generate a dynamic movement depending on the point of view of the observer.